Wickham, 21, only made eight Premier League starts before this season, but scored five goals in the final nine games as the club avoided relegation. "It wasn't my fault the clubs agreed that fee," Wickham told BBC Newcastle. "Hopefully I've showed the potential as to why they paid so much and I'll continue to do that next season." 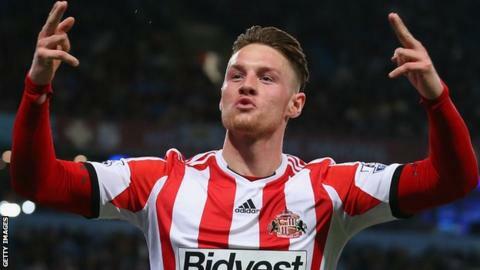 Sunderland midfielder Lee Cattermole believes Connor Wickham "grew up" during the 2013-14 season. "It was always going to be a case of Connor growing up and becoming a man," Cattermole told BBC Newcastle. "He's been given a chance at a time when he's been playing games, not sat still and that's important. He continued: "We'll all work hard next season, I'll keep working hard and hopefully be in from the start, not on loan and starting games." The England Under-21 international was just a teenager when he completed his switch to Wearside after 13 goals in 65 league games for Ipswich. However, he was largely a peripheral player under managers Steve Bruce, who signed him, Martin O'Neill and Paolo Di Canio. Gus Poyet's arrival as head coach led to loan spells at Sheffield Wednesday and Leeds, and although he caught the Uruguayan's eye with nine goals, resulting in a recall to the Stadium of Light. "It would have been great to play at Wembley, but I wasn't going to be involved in the team," Wickham added. "I'd rather go to play football in front of one man and his dog, than sit in the stands with 90,000 people. "In the end my performances showed the manager I was maybe what he needed, he called me back, thankfully I went straight into the team and from there we gelled together and sorted our problem out."